Today is a day that I’d like to take a moment to acknowledge and bring light to an issue facing so many of my friends that is rarely discussed. In the age of instant information and constant Facebook and Twitter updates, I have been witnessed to so many happy mothers-to-be become devastated with the grief of miscarriage. Several close friends in fact have suffered from this unbelievable loss within this past year alone. Millions of things had to go right for my sweet Cedella to be born. Millions. Life is so incredibly fragile and precious that without those millions of things going exactly right, we wouldn’t have Cedella to hold and kiss. But to think of going through the simultaneous elation and trepidation of finding out your pregnant. Mentally and physically preparing to welcome a new life into the world. Talking and planning how this new little person will be cared for, and how they will change your world. Only to have one in a million things go wrong. Only to find out that the little seed of life you have been carrying is gone. On the day we left the hospital to take Cedella home we were waiting for the elevator with a nice looking guy who was absolutely beaming at us. Michael had a matching grin and the two guys fell naturally into a conversation. The guy congratulated Michael and told him what a beautiful family he had and what a beautiful little baby. Michael congratulated him in return and asked where his wife and baby were. The man leaned in very close to Michael and whispered to him “My wife is resting in her room, but my baby has gone to heaven”. Michael took the man’s hand and said how sorry he was. The man just responded “It was God’s will”. I didn’t hear this part of the conversation. I guess they didn’t want to upset the new mama with the fragile feelings. We talked about that man all the way home. How could he smile at us? Why wasn’t he breaking down? How could he be so at peace with losing his baby? The conclusion we came to…he understood that his child was not for this world and that he’d see him in the next but that inside he was suffering as much as we both would have been. I had no idea that in the midst of my happiness there were so many others suffering quietly. Maybe they were glancing at the thousands of pictures I posted on Facebook and were hurt that they would never have a chance to hold their own little fleeting angel. Maybe they were hurt and angry that their god took their child before it even had a chance to live. Maybe it was the second or third time they had lost a child. Maybe they felt it was their last chance to be a mama. Yet we don’t talk about this loss in public. It is hushed in conversations between girlfriends or between friends in private emails. No one (including myself) knows what to say beyond “You’re in my thoughts and prayers”. What if the women who had lost a child could tell us what they need. What if they could feel free and open to admit and talk about their loss without making people uneasy or uncomfortable. We need to treat miscarriages and stillbirths like exactly what they are…losses of life. So if there is someone you know that has suffered a loss this year, or ever, please take a moment to offer them your shoulder to cry on or your ear to listen to what they are going through. There are many organizations to help those that are grieving, maybe finding a group is just what your friend or loved one needs to help get through the grieving process. 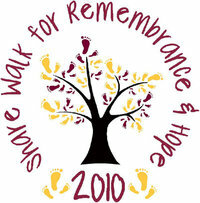 Also, October 15th is officially recognized day for Pregnancy and Infant Loss Remembrance Day. You can learn more about this day through the October 15th website. Please light a candle or spare a moment of thought or prayer for those women who have gone through this devastating loss. To all my friends that have gone through the pain of losing a pregnancy or a child, please know that I love you and my thoughts and prayers are indeed with you. I may not know just what to say, or just how you’re feeling, but you are stronger and more amazing, and impress me with the grace in which you continue to be good women, mothers, wives and friends. And finally, thank you to Danielle for asking me to blog about SHARE and to talk about this ‘taboo’ subject. Your an amazing woman Dani! !